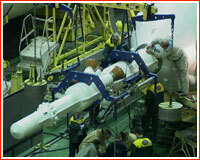 The hardware resources and propellant properties employed in the design of the Soyuz reentry capsule limit the safe operation of the craft in space by six months. Since at least one Soyuz had to be docked to the ISS constantly to provide emergency escape for the residents of the station, Russia planned the replacement of the Soyuz every six months. The missions to replace Soyuz at the International Space Station became known as "taxi" flights. The Soyuz TM spacecraft (Tail Number #206), which was in standby readiness during Mir deorbiting at the beginning of 2001 was reassigned as the crew rescue vehicle for the International Space Station in April 2001. There, it would replace the older ship, which has been docked to the ISS since November 2000. So-called "taxi crews" were to pilot Soyuz TM ships to the ISS. After spending a few days onboard the station the taxi crew would return home onboard the previous craft, leaving "resident" crew of the station with a "fresh" lifeboat Soyuz TM. Officially, the taxi crews would include two cosmonauts, however, RKK Energia continued the efforts from the Mir era to find commercial passengers for the third available seat onboard the craft. Dennis Tito, the US millionaire, who initially booked a flight to Mir for some $20 million, became the first candidate for the passenger seat in the taxi crew. The original plans called for the Russian female cosmonaut Nadezhda Kuzhelnaya to be on the first taxi crew to the ISS. 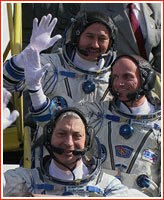 However, RKK Energia's decision to fly Dennis Tito required a change in the Russian part of the crew. 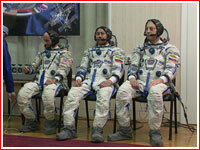 Since Tito speaks very little Russian, RKK Energia assigned English-speaking cosmonauts on the crew. The Russian decision to fly Tito to the ISS has received cold reception at NASA. Although, many sources at NASA said that it would resist the Russian plans, the agency's official position on the matter remained unclear until Tito and his crewmates arrived to Houston for training in March 2001. The officials at Johnson Space Center denied Tito access to the facility, resulting in the decision by two cosmonauts to boycott training in solidarity. March 20: Russian Aviation and Space Agency, Rosaviacosmos, ordered two Russian cosmonauts to resume training in Johnson Space Center, some 24 hours after the cosmonauts refused to enter this NASA facility in solidarity with a fellow crew member Dennis Tito. Cosmonauts Talgat Musabaev, Yuri Baturin, and US businessman Dennis Tito arrived to Houston for a familiarization with US segment of the ISS. However, NASA, which essentially opposed Russian plans to ferry commercial passengers to the ISS, denied Tito the entry into the training facility at Johnson Space Center in Houston, TX. Rosaviacosmos officials said that they understood the motives of the cosmonauts, however, they directed the crew to resume training as planned. However, both Rosaviacosmos and RKK Energia stressed that Dennis Tito would be onboard the Soyuz slated for launch toward the ISS in April. The spacecraft serves as a lifeboat for the station and at least one Soyuz should be constantly docked to the manned outpost. Rosaviacosmos officials echoed this statement, saying that Titos flight in April would proceed as scheduled. Sergei Gorbunov, press-chief at Rosaviacosmos said that NASA was informed about the issue in time and under all established procedures. April 11: An interagency commission, which held a meeting in the Star City on Tuesday, April 10, cleared Dennis Tito for the flight onboard Soyuz TM-32 spacecraft scheduled to lift off on April 28. NASA pressured Russian Aviation and Space Agency, Rosaviacosmos, to postpone the flight at least until October, citing safety concerns. After formal meeting in Star City, Russia's Gagarin Cosmonaut Training Center, TSPK, Russian officials found Tito to fit for a week-long mission to the International Space Station to replace Soyuz spacecraft, which serves as lifeboat fot the station crews. During his mission, Tito will be accompanied by the commander Talgat Musabaev and flight engineer Yuri Baturin. 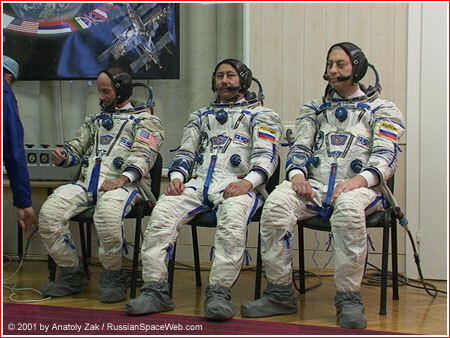 April 18: Two Russian cosmonauts and a tourist from the United States tried their seats inside the Soyuz TM-32 spacecraft on Tuesday, April 17, in preparation for the April 28 launch from Baikonur Cosmodrome toward the International Space Station. The crew including the commander Talgat Musabaev, flight engineer Yuri Baturin and US businessman Dennis Tito arrived to Baikonur on Monday. During a routine procedure, informally known in Russian as "otsidka" or "sitting in" in English, the crew members entered and took their seats inside the reentry capsule of the Soyuz, to do final adjustments in their recliners and to allow determining the exact center of gravity of the spacecraft with the fully suited crew onboard. While the preparation for the mission entered its final stage, Russian space officials were still trying to receive a formal approval from NASA for the flight of Dennis Tito to the ISS. NASA pressured Russian Aviation and Space Agency, Rosaviacosmos, to postpone Tito's flight at least until October, citing safety concerns. The sources in Moscow said that as of Wednesday there was no agreement on the matter, however, Dennis Tito would be onboard the spacecraft in any case. Tito paid around $20 million for his space flight -- the money crucial for the cash-strapped industry. With the completion of the tests in Baikonur, Tito's crew was scheduled to fly back to Moscow on Wednesday and return to the launch facility on April 23. 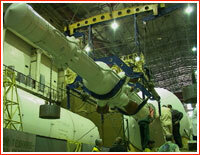 A day later the cosmonauts will enter their Soyuz again to familiarize themselves with its final flight configuration. The Soyuz TM-32 is scheduled to be integrated with its launch-vehicle on April 25 and rolled out to the Launch Pad 5 in Area 1 in Baikonur on April 26, two days before launch. The Soyuz docking with the ISS is expected on April 30. The purpose of this mission is to deliver to the ISS a fresh Soyuz spacecraft, which serves as an emergency rescue vehicle for the resident crew of the station. The cosmonauts Musabaev and Baturin, known as the "taxi crew," will return to Earth a week later along with Dennis Tito, onboard the previous Soyuz-TM-31 spacecraft. The Soyuz-TM-31 docked to the ISS last November and should be replaced within six months, according to the Russian safety standards. April 23: The Soyuz taxi crew arrived to Baikonur in preparation for the launch on April 28. April 24: The cosmonauts of the taxi crew conducted their final inspections of the Soyuz TM spacecraft today before the craft's planned integration with the launch vehicle. 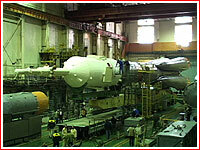 At the time of the inspection, the Soyuz TM was located at its assembly station inside the checkout building at Site 254. April 25: Russian space officials gave a green light to the rollout of a launch vehicle with the Soyuz TM-32 spacecraft today clearing the way for its planned launch on April 28. Around 6 p.m. local time on Wednesday, April 25, the State Commission, which gathered in Baikonurs Area 254 to review the readiness of the spacecraft, approved the rollout operation. The rollout from the assembly building in Area 2 to the launch pad in Area 1 in Baikonur is expected to take place during morning hours on April 26. Wednesday started in Baikonur with a traditional ceremony of the raising state flags of Russia, Kazakhstan and United States in front of the Baikonur hotel at Site 17. The flags represented the origin of three participants in the upcoming mission: Dennis Tito, the American space-tourist-to-be, the commander Talgat Musabaev, who was born in Alma-Ata Region in Kazakhstan and flight engineer Yuri Baturin from Russia. 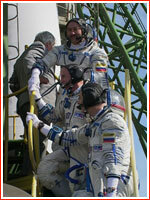 The crewmembers then gave a rare improvised interview to a crowd of journalists gathered for the flag-raising ceremony. Tito confirmed that NASA had withdrawn its objections to his mission and would allow him limited access to the US segment of the station. 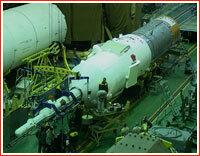 In the meantime, at Site 2 in Baikonur, the processing crew were conducting the integration of the Soyuz TM-32 spacecraft with its launch vehicle. Despite some difficulties with the installation of the emergency escape rockets on the nose of the Soyuz around noon local time, the craft and its upper stage were successfully integrated with the rest of the launch vehicle by 13:30 Baikonur Time on Wednesday (3:30 a.m. EDT). April 26: Soyuz TM-32 rolls out to the launch pad.The Soyuz TM-32 spacecraft is poised for blastoff at its launch pad after a spectacular sunrise rollout on Thursday at Cosmodrome Baikonur in Kazakhstan. The spacecraft and its launch vehicle left the assembly building at Area 2 in Baikonur at 7 a.m. local time, just minutes after the sun rose over the steppe. Half an hour later, the rocket and the spacecraft arrived at the launch complex Number 5 in Area 1, commonly known as Gagarins pad. The Vostok-1 spacecraft, carrying the first man into space, was launched from the same pad in 1961. Upon arrival to the launch complex, the railroad erector lifted the rocket into vertical position and around 8:30 a.m. two gantry also lifted into vertical position, enclosing the rocket into the array of access bridges. In the next two days the processing personnel will conduct final preparations for the launch scheduled at 13:37 local time (3:37 a.m. EDT) on Saturday, April 28. 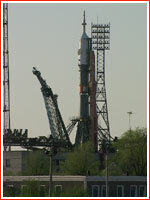 April 27: After hours of uncertainty over the computer problems on the International Space Station, the Russian space officials here in Baikonur made a decision to go ahead with the launch of the Soyuz TM-32 spacecraft as scheduled. Around 10:30 local, 1 a.m. EDT, on Friday, April 27, the Russian State Commission, composed of key figures responsible for the launch, announced that the Soyuz TM-32 spacecraft would blast off toward the ISS on April 28, as planned. The commission met at Site 17 in Baikonur for its traditional pre-flight meeting, amid speculations that NASA asked to postpone the Soyuz launch until April 30 or May 1. In the past few days, computer malfunction crippled the ISS flight control system, forcing NASA to consider keeping the Shuttle docked to the station for two extra days. The Shuttle could provide the attitude control of the orbital facility, before its own flight control system had been repaired. As a result, the winged spacecraft would not have left the station before the Soyuz TM-32 would arrive for its planned docking with the outpost on April 30. NASA officials believed that the docking of the Soyuz in the presence of the Shuttle at the ISS would be too dangerous and pressured Russia to postpone the launch until the Shuttle leaves. The scheduled helicopter overflight of the areas below the Soyuz launch path scheduled for the early morning hours on Friday was delayed several hours due to the uncertainty over the launch date. The overflights design to assure that there are no people or property on the ground along the rockets flight path and should be conducted no more then three days before the scheduled launch. According to Yuri Semenov, the chief designer of RKK Energia, the Soyuz spacecraft manufacturer, the analysis of the situation showed that the docking of the Soyuz could be conducted safely while the Shuttle still docked to the outpost. Semenov said that he has not received an official request from NASA to postpone the launch and that the irreversible operations on the Soyuz launch complex had already started. Later on Friday, however, the sources at the Russian Aviation and Space Agency said that the official request from NASA to postpone the Soyuz launch did arrive sometime after the meeting of the State Commission in Baikonur. Around 14:30 a.m. local, 4:30 a.m. EDT, the space officials in Baikonur said that the ISS flight control system had been restored. According to Sergei Gorbunov, the press-chief of the Russian Aviation and Space Agency, NASA had withdrawn its request to postpone the Soyuz launch and the Shuttle would undock from the station as a scheduled. Ironically, NASA representatives in Moscow, maintained that the US request to postpone the Soyuz launch remains in place. 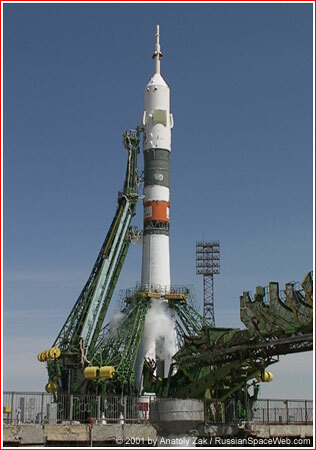 Despite this new rift in the relationship between two space station partners, the preparations for the launch of the Soyuz TM-32 proceeded as scheduled. April 28: The Soyuz TM-32 spacecraft entered orbit after a flawless launch on Saturday, April 28 from Cosmodrome Baikonur, Kazakhstan. A three-stage Soyuz rocket blasted off at 13:37 local time (3:37 a.m. EST) from Launch Complex 5 in Area 1 in Baikonur with commander Talgat Musabaev, flight engineer Yuri Baturin and the US tourist passenger Dennis Tito. At 6:30 a.m. local time, the crew of three left Cosmonaut Hotel at Site 17 here in Baikonur early morning traveling by bus to the suiting and checkout facility in Area 254 in Baikonur. After donning their pressure suites, the crew appeared in the final pressure check room, where a crowd of reporters, photographers, relatives, friends and wellwishers greeted them from behind of a glass wall. The crew commander then reported to the chairman of the State Commission about its readiness for the flight right outside of the checkout building at Area 254, and then boarded a bus for the trip to the launch pad. 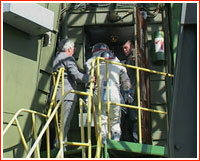 The cosmonauts then climbed the stairs of the launch gantry and entered the elevator, which delivered the crew to the hatch at the top of the Soyuz rocket. The Soyuz TM-32 entered its nominal orbit and as of April 29, conducted normal maneuvers to rendezvous with the International Space Station. April 30, 11:58 Moscow Time (3:58 a.m. EDT): The Soyuz TM-32 spacecraft docked with the ISS and several hours later the crew entered the station. May 6: After trouble-free stay onboard the International Space Station, ISS, its first "taxi crew" including commander Talgat Musabaev, flight engineer Yuri Baturin and first space tourist Dennis Tito successfully touched down in Kazakhstan. The cosmonauts landed several hours after their Soyuz TM-31 spacecraft undocked from the rear port of the Zvezda service module of the ISS. The Soyuz TM-32 spacecraft, which "taxi crew" piloted to the ISS a week earlier, will remain at the station until October, serving as a "lifeboat" for the resident crew.